I Am Mike D: What a Joke! Here we go again, the racist tag thrown around to belittle someone that you don't agree with. Yay journalism! Here how I see it, first of all, if he is doing a Chris Rock impression, it is the the worst I have ever heard. Second, the guy is from Brooklyn, and like a few people from around there, he has a bit of an accent... I could tell no difference from how he talked at the beginning to how he talked at the end. That is, as far as I can tell, how he talks. Third, if he was doing a 'voice', I would have called it more of a Christopher Walken. But since Christopher Walken is a white guy, it is harder to label him as 'racist' for doing that. Of course in the comments, the liberal lemmings take the bait like sharks to chum. What can I say? This is almost as disgusting as Sarah Palin's VP campaign rallies. Let's face it, there's no way around it,. the Republican Party is the old southern dixie-crat, un-repentent, segrationists in a new suit. These folks have no ideas, no policy proposals, no solutions, and they are left with all that they are good at - name calling - disgraceful! Woo! we got Palin in the first comment! How many of them do you think heard the guy actually speak? How many of them said like stuff about Bush? Seriously, there was not one ounce of racism in there. He is just a guy that isn't too happy with the president that is currently in office. There is nothing wrong with that is there? 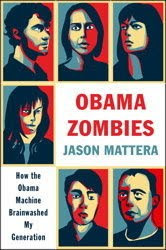 BTW, here is a link to Jason Mattera's book, Obama Zombies: How the Obama Machine Brainwashed My Generation. I just pre-ordered one. He can thank Kate Zernike for pointing me his way.